I went to 8502.Bauhaus today hoping to purchase the exclusive black version of their new top, discounted for today's Blue Friday celebrations, and while I was there it struck me that I'd missed quite a few new releases from this chic little GridRock City shop (Blink Teleport here). 8502.Bauhaus pledges proudly to release something new every week, which is the kind of regularity I really like to see as a consumer. Since I hadn't been there in a couple weeks, there were quite a few new treasures to uncover. First up is the Cute Minitop shown above. My favourite color in this is the darkest shade of khaki, which shows the texturing on the item the best. The black version of this top is on sale for 99 BLU$ today, and has a leather-like sheen while the other three colors are more or less matte. It's a great limited edition item, so of course I picked it up as well. Next, I was sure to snag the super cute denim micro miniskirt. While it's also available in a camo print, this version is a little more versatile and also has one of the best denim textures I've seen in Blue Mars so far! I was also thrilled to see three sets of bangles in gold, silver, and mother of pearl. Of all the accessories available in Blue Mars right now, bracelets are still quite hard to come by and sometimes they're the perfect item to finish an outfit. Lastly, I bought these super cute western-inspired boots. 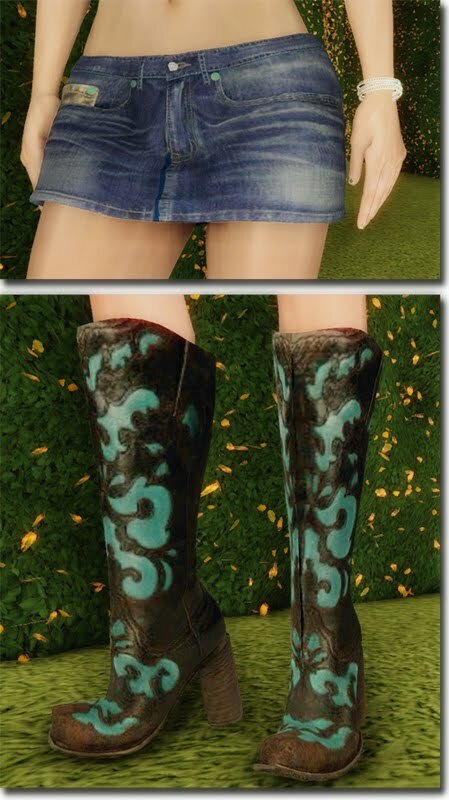 As with most items at 8502.Bauhaus there are multiple colors available, but these dark brown boots with turquoise inlaid accents are by far the most striking. If you're curious, I took my pictures for today's post inside the cheerful little hedge tunnel just outside the shop. It might seem silly, but I think this might be one of my favorite photography scenes so far! And of course, remember to submit your beautiful and unique makeup looks this weekend before the contest closes! See the rules here, and check out all the tips and inspiration I have for you here!